In flat calm water, Cutter Loose leaves the relative tranquility of Boca Chita and is en route north in Biscayne Bay to Dinner Key in the City of Miami. Upon our arrival, the village of Coconut Grove is bustling with activity. 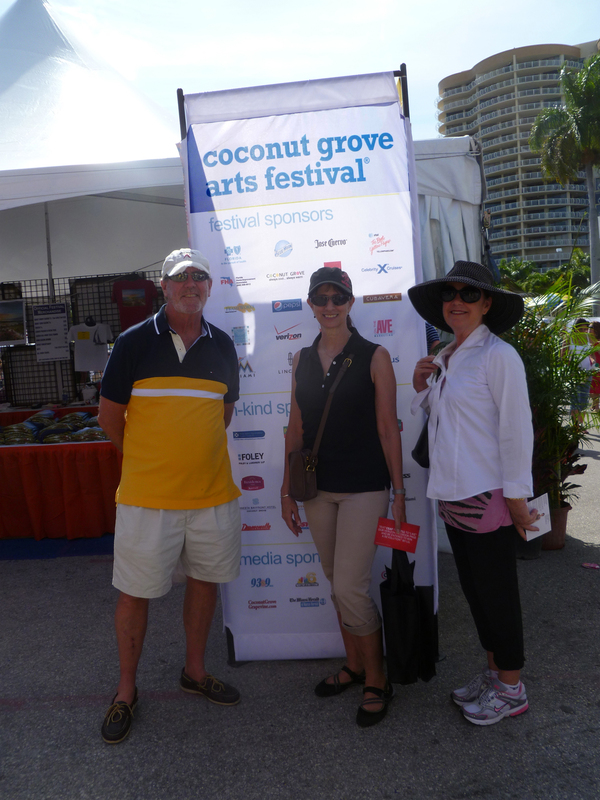 President’s Day weekend is the date for the annual Coconut Grove Arts Festival. The entry fee is $10 per person and cyclone fencing surrounds a major portion of the waterfront and downtown to prevent unauthorized admission to the show. 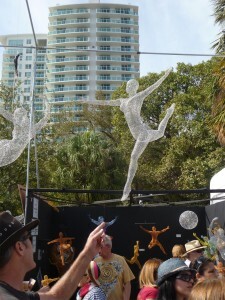 In addition to works of art, musical performances take place on the main stage throughout the day and well into the evening. An impromptu rendezvous with friends Stephani and Robin adds to the enjoyment of this hot (86 degrees) and sunny winter afternoon. In the days ahead, Dinner Key will serve as the staging area for our passage across the Gulf Stream to the Bahamas. This passage must be timed during a period of settled weather… preferably a 2 to 3 day window of light to moderate winds from the south. While waiting for this window to materialize, there is a long list of chores and provisioning to be accomplished in Coconut Grove. Since groceries and supplies in the Bahamas are limited and quite expensive, Cutter Loose must be provisioned with several months of stores. While watching and waiting for a weather opening, we will attack the ship’s to-do list within the backdrop of this delightful community.